Established in 1985, Kooy Brothers is a family owned and operated retail equipment superstore. We possess intimate knowledge of the landscape and snowplowing industry as well as the construction market. Kooy Brothers caters to everyone from landscaping contractors to snowplowers, golf courses, municipalities, property management companies, construction companies, masons, hobby farmers and of course home owners. Kooy Brothers carries many different types of power equipment, attachments and spare parts from over 50 different industry trusted manufacturers. We offer full service on everything we sell and perform all warranty work on-site. Kooy Brothers also offers in-house custom financing/leasing through Providential Financial. Our goal is not only to satisfy our customer’s needs for top quality equipment, but we also strive to provide unmatched service that goes above and beyond their expectations, allowing them to recognize why Kooy Brothers upholds an excellent industry-wide reputation for being the #1 trusted power equipment dealer in Ontario. No piece of equipment sold in store comes in a box. With every equipment purchase, our qualified service staff will assemble the product and show the user how to operate it before the product leaves store property. All at no extra cost. Largest volume Kubota equipment dealer in Canada. At Kooy Brothers we are constantly working on serving you better. We realize that when we perform well, our customers are better served. Kooy Brothers strives to stay on the leading edge of the equipment industry and will continue to supply exceptional products, parts and service to the GTA for many years to come. Bill and Harry Kooy started Kooy Brothers part-time from their parents garage back in 1983. As the part time business started growing and got noisier they were forced to vacate their parents backyard. 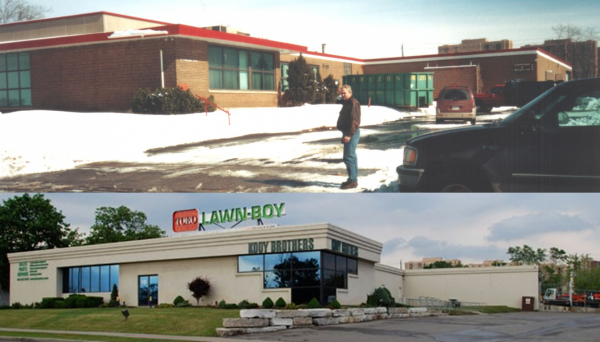 On April 5, 1985, Kooy Brothers moved the company from the backyard to a 2,000 sq. ft. building on 32 Gordon MacKay Road in Toronto. Now the business became full-time and they put everything they had on the line. The parts shelving consisted of reclaimed bread racks from a local bakery and we wondered how we would sell our initial inventory of 20 Lawn-Boy lawn mowers. A month after we first opened our doors we were robbed of everything except for one Phillips screwdriver in a tiny red toolbox. Sadly, we had no insurance at the time so starting over was our only option. In those early years, reel mowers were found on every Landscapers truck and on golf courses and sod farms. We found ourselves grinding so many reels that we hired our brother Len to help out. In the fall of 1985 we managed to import the best reel grinder in the world (Mowing Machine Grinder), from England. It was the first one in Canada, fully automatic and liquid cooled. Armed with this new machine, our business began to flourish. We found ourselves grinding an average of 2000 reels a year! With all this additional business we had to hire our sister Francine to keep up with the book-keeping. We were so fond of this Mowing Machine Grinder that we became Canadian Distributors in 1986. Unfortunately in 1987 the English owner sold the business to Ransomes, (a well known turf company headquartered in Ipswich, England) and we were unceremoniously dumped as distributors. In 1988, with youthful optimism, we decided to open our own manufacturing company. With the help of an American partner, Don Cotton, T.I. International was born in downtown Andalusia, Alabama. With the help of 3 employees imported from the English plant, we soon produced our first replacement reel assembly. By the time we sold the company in 1994 to Land Pride Turf, we were manufacturing 150 different reels, a full line of grinding machines and a host of other parts. The recession in the early 1990’s caused considerable stress on T.I. International and Kooy Brothers Lawn Equipment. After the sale of our manufacturing plant, all efforts were directed back towards making Kooy Brothers the lawn equipment industry leader. With the encouragement and help of people like Tony Speelman (Speelman’s Garden Centre), Kooy Brothers continued to grow. Every time we grew, we added another family member to the staff. In 1999 Kooy Brothers became a Kubota dealer. With the addition of this line, we were forced to add more space to accommodate the additional business. After adding all the space we could at 32 Gordon Mackay and sometimes taking over the neighborhood, it became apparent that it was time to move to a larger facility. In the spring of 2001, Kooy Brothers moved to a new location at 15 Torbarrie Road in Toronto. This new building was being used as a sewing warehouse and needed some renovations but the location was highly visible from the busy hi-way 400 and the 23,000 square feet of space was far larger than what we were coming from. With the additional room, business continued to blossom. In 2003, Kooy Brothers became the first Blizzard Snowplow dealer in Toronto. In the spring of 2004 we were again short of room and subsequently purchased the building next door. That fall, we demolished two thirds of the new building to make room for a new parking lot. In 2005, Kooy Brothers became the Ontario distributor for Blizzard Snowplows and DownEaster Salters. Business continued to flourish and now with a staff of 36 and a loyal customer base in the thousands, space and parking were again becoming major issues. We decided once again to move the business to a larger location if we could and keep all the talent under one roof. 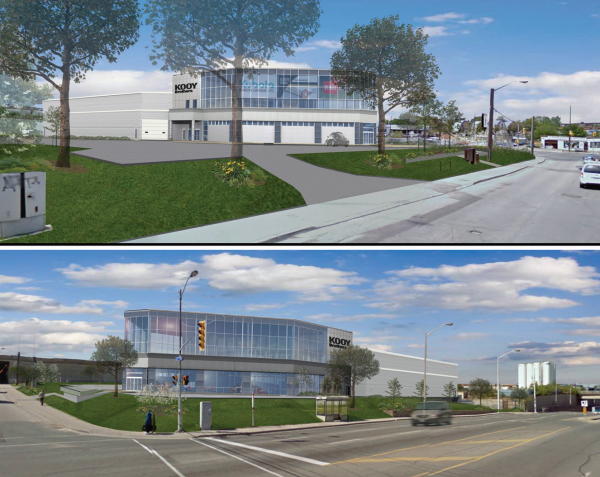 In May 2009, Kooy Brothers officially acquired 4 acres of land at 1919 Wilson Avenue in Toronto. The new building design plans were drawn up and planning for Kooy Brothers 3rd move was underway. We moved into our beautiful new facility at 1919 Wilson Avenue December 2010. ...to be continued!